Photo retrieved from Twitter @Athletics_RCI, posted May 15, 2017. To see more photos, please visit the Photo Gallery. 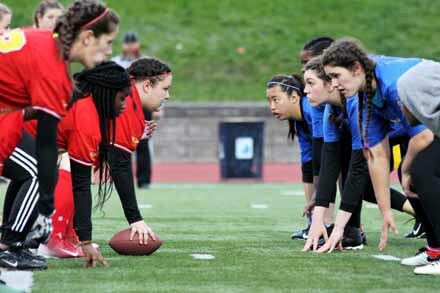 The TDSSAA Flag Football season has now come to an end. 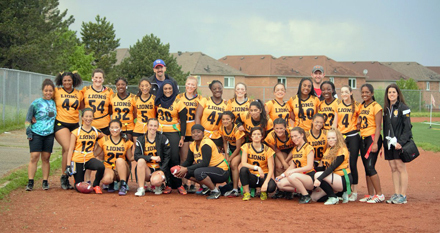 Congratulations to RH King Academy and Northview Heights SS for winning this year's Tier 1 and Tier 2 City Championships! Great season ladies! Hope to see everyone back next year! Special thanks to all the coaches, volunteers, and parents for helping make this season happen! Hope to see you all again next year! RH King A team photo after winning the City Championships. Photo retrieved from Twitter @RHKSports101, posted May 30, 2017. To see more photos, please visit the Photo Gallery. RH King Academy won six nothing against Richview Heights at this years Tier 1 City Championships! Congratulations to both teams for having such a successful season! Hope to see you all back again for another amazing seasons! Have a good and safe summer ladies! Northview Heights SS played AY Jackson SS for the title of City Champions though rain, sun, wind, and even loud roaring thunder! However, Northview pulled a lead, scoring a touchdown midway though the game. This touchdown won Northview Heights SS the City Champion game! Congratulations to both teams for such an exciting game and amazing season! Hope to see you all back next year for another fun and successful season! Have a great summer ladies and good luck with the rest of your school year!